Whether it’s your first child or your fifth, just surviving the first few months of your baby’s life as a mom can be quite the adventure. You’re exhausted, your entire body is sore, you’re riding a roller coaster of undulating hormones, and there’s a precious, tiny creature that demands the vast majority of your time, energy, and attention. If all that weren’t enough (which it definitely is), you also have to deal with the seemingly endless parade of well-wishers and looky-loos. Even the most extroverted of new mothers can be put off by a house full of family and friends wanting to hold the baby, but to an introverted new mom, it’s practically torture. What’s more, voicing your true feelings after having a baby can be incredibly difficult. You don’t want to appear selfish or stand-offish — and you certainly don’t want to hurt anyone’s feelings — but there are so many things you wish you could say to the friends, family, and absolute strangers who just can’t seem to take a hint. If you’re looking for some tips to take care of the loved ones who are pushing boundaries or overstaying their welcome, look no further! Having a baby is a truly joyous occasion. That’s why it’s no surprise that all your loved ones are so anxious to see and hold the baby shortly after it’s born. However, bringing a baby into the world is also stressful and exhausting. As an introvert, the last thing you want is a veritable crowd of people strolling through your hospital room when you’re busy trying to bond with your little one. So many visitors (whether expected or not) can be overwhelming. Don’t feel bad if you’d rather not have visitors while you’re in the hospital — it’s not in the least bit unusual. Let family and friends know ahead of time that you’d prefer visits to wait until after you’ve returned home. Hospital staff will also be happy to help. You can request that no information be given over the phone, and that no visitors are allowed into your room. If you’re okay with a few visitors, you can ask that they don’t stay too long — 15-20 minutes should do the trick. Let them know that you are recovering and need rest, and that there will be plenty of time to see the baby in the near future. Ask your significant other (or whomever is acting as your support) to work as a gatekeeper of sorts. Have them screen guests and notify them of approved visiting hours, time limits, and so on. Once you get baby home, you’re bound to have a lot of people who want to drop in unannounced. Ask friends and family to text or call before coming over. Point out that you’ll have unpredictable sleeping patterns, and that they may disturb your sleep or recovery if they just stop by at any random time. It’s also helpful to mention that you don’t have a lot of energy, and that you may only be up for a half hour visit or so. If your guests are a bit oblivious, you can usually get them to leave by saying it’s nap time and mentioning how you usually sleep when the baby does. If you’d prefer to have your visits take the “one and done” approach, consider having a sip and see party, an open house style event where friends and family come see the baby. You can put out drinks and snacks, and even craft projects (like this adorable upcycled menagerie) — this allows friends and family to take part in decorating the baby’s room. In one afternoon, you can get all the visits out of the way and look forward to some peace and quiet. If all else fails, put a sign on the door, disable the doorbell, and put your phone on vibrate. Your comfort and bonding time with baby are what’s most important. When it comes to babies, everyone is an expert. Family, friends, and even complete strangers will practically line up to give you advice on anything from the benefits of breastfeeding to the controversy over swaddling. And then there’s the judgement — there isn’t a mom alive who hasn’t felt judged at least once. This unsolicited advice and scrutiny can work to undermine your confidence and stir up the kind of emotions that make you feel like garbage (not to mention make you see red). If you truly want or need advice, you can turn to a trusted source. Just remember that, in the end, nobody knows your baby better than yourself. In those first few weeks and months after having a baby, you’ll be cycling through a lot of different emotions, some good and some bad. 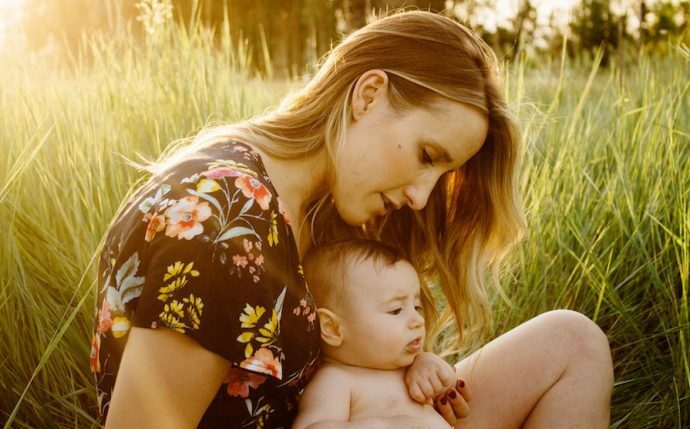 It’s 100 percent okay if you don’t feel like everything is sunshine and rainbows all the time — this does not make you a bad mom! However, if you find that your emotions are hitting extremes, and getting in the way of both your daily life and bonding with your baby, it might be time to talk to someone. Overwhelming spells of sadness, anxiety, or anger can be a sign of postpartum depression. An average of 15 percent of women suffer from postpartum depression, making it the most common complication of childbirth. If you suspect you may be be depressed, you don’t have to feel ashamed or alone. The best thing you can do is to talk to a professional and get the help you need. Though it can be a pain at times, being a mom is bound to be one of the most amazing journeys of your life. As an introverted mom, you have so much to offer your little one. So cuddle that baby close, pour out all the love you possibly can, and don’t let anyone get in your way!